If Batgirl from #35 on is meant to be DC’s response to Ms. Marvel, Gotham Academy might just be the response to Lumberjanes. In that it might just become my new favorite thing out of DC Comics. 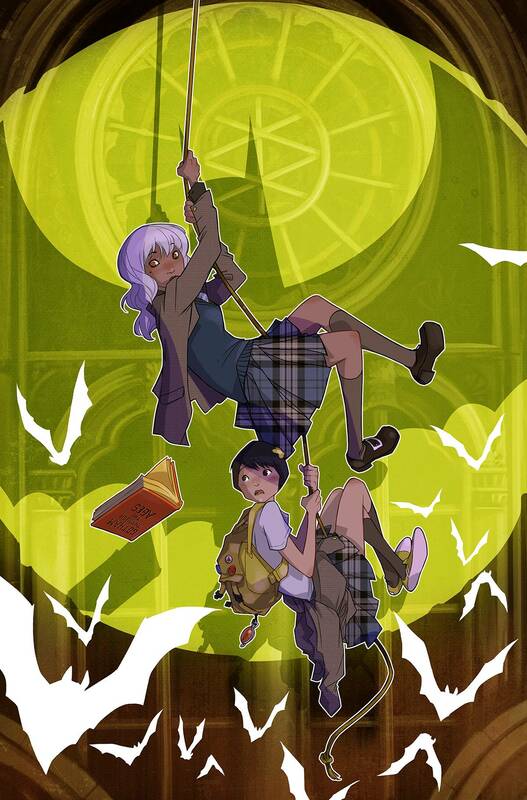 Gotham Academy opens on a dark and stormy day, with brooding Olive Silverlock reluctantly showing her best friend Maps Mizoguchi around the campus of the elite Gotham City boarding school. Olive is there on scholarship, but something over the summer made her go from “normal” in her freshman year to distant in the beginning of her sophomore. And it has something to do with Batman. I think Andy Khouri of Comics Alliance put it best when he described the series as a mix of Batman, Harry Potter, Lumberjanes, and his “vague understanding of some type of manga.” Cloonan’s writing style is dark and immersive, leaving a lot of mystery and shadows to explore. Unlike a lot of her heroes though, Olive and Maps are definite troublemakers in the vein of the girls from Lumberjanes. While Olive might be kind of broody, she knows the best kind of trouble to get it. Not to mention that Maps is the cutest nerd this side of Burnside. Her enthusiasm is a perfect foil to Olive’s introspectiveness. The first issue was a lot of set up. Introducing us to Olive and Maps along with the atmosphere of Gotham Academy as well as the mystery of what happened to Olive over the summer. It was a bit frustrating wanting to know more about it, but I guess that’s what a good first issue is supposed to do. Hook me in and make me read more. Between Cloonan and Fletcher’s writing and Kerschl’s adorable art that makes me want to see this animated, I’m already enrolling myself for a semester or two. Final Thoughts: Dark, yet fun, Gotham Academy is a fun intro to a side of Gotham City that we may not usually get to see. It also includes young girls on adventures, which is also a plus.